The second set of games got underway from Group A as a crowd of more than 50,000 came out to cheer on the home squad in Frankfurt. France and Germany each got a win to secure a berth in the quarterfinals. Sinclair shows her disappointment as France celebrates their big win. France became the first team in the tournament to score more than two goals in their dominating performance against the Canadians. This game was supposed to be close, as these two teams were expected to compete for the second place spot in the group. 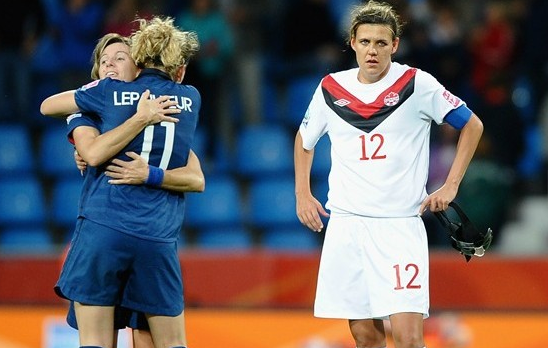 However, the French came out very strong and Canada completely broke down in the second half. France got on the board in the 24th when playmaker Louisa Necib dribbled into the box and laid the ball off for Elise Bussaglia. Her shot from the top of the box was deflected, but went right to Gaetane Thiney, who headed the ball over the Canadian goalkeeper Erin McLeod. Thiney add another in the 60th when Marie-Laure Delie hustled to contest a Canadian clearance. The ball landed at Thiney’s feet, and she placed her right-footed shot off the inside of the right goalpost. Camile Abily got her first goal of the 2011 Word Cup campaign in the 66th, when she was left unmarked on the corner, and headed the cross into the upper left 90. Substitute Elodie Thomis really put the dagger in the Canadians in the 83rd. She took a great ball over the top from Necib, took one touch around McLeod, and placed the ball in the empty net. The French looked like the stronger team throughout the game. They looked comfortable on the ball, and were able to move the ball around the midfield with ease. The Canadians looked a step slow, and struggled to keep possession anytime a player other than Matheson or Sinclair had the ball. Even once they went down a goal, Canada wasn’t able to generate any dangerous chances, and were content to shoot the ball weakly from 25 yards out. It didn’t help that Sinclair wasn’t playing like her usual self. She seemed hindered by the plastic mask protecting her broken nose. (Honestly, who wouldn’t be? She looked like someone had wrapped a roll of electrical tape around her head.) Sinclair too often looked to lay the ball off to a teammate, rather than go to goal herself, which is what the Canadians need from their best player. Some analysts had Canada as a sleeper to make it to the semi-finals, and our neighbors to the north are seriously disappointed to have only pride to play for in their final match. France, on the other hand, currently sits atop the group due to goal differential, and has to have a ton of confidence going into the final match in the group stage. Germany got the expected win over their African opponents, though they did not dominate the Nigerians, which many suspected they would. The Nigerian team came out playing a very physical game, and placed a lot of pressure on the German players all over the field. The Nigerians were aided in their strategy by the referee, who allowed play to get more and more physical, without issuing appropriate warnings. German goalkeeper Angerer picked up a couple knocks which should have drawn a foul, at the very least. However, the strategy was clearly effective as the Germans appeared flustered in the first half, and had difficulty keeping possession. Despite the Nigerians ability to put pressure on Germany, they were unable to produce much attack when they did possess the ball. They possessed the ball fairly well in the midfield, but their final ball in the attacking third rarely found a teammate’s foot, and were often straight down the middle of the pitch to the German goalkeeper. Germany was finally able to get a point on the board in the 54th. They took a free kick from the left side of the box, and played a short ball into the near side of the six. The flick onto goal by Grings was stopped, but Laudehr was able to put away a second rebound with a right-footed shot from near the penalty spot. The Germans are happy to come away with another three points, but they’ll need to secure a win to end up atop the group. They currently sit second, behind France, due to goal differential. Nigeria looked much more organized defensively than in previous World Cups, and they hope to score their first goal of the tournament in their final game. Frankie’s Pick: I’m excited for this match-up between the two European neighbors. Look for Germany to spread the field on offensive, and France will utilize Necib’s playmaking skills to create opportunities down the wing. I predict a 2-2 tie as both teams will be pressing to win the group. Frankie’s Pick: Nigeria will come out pressing like they did against Germany. They’ll get an early goal off a Canadian turnover. However, Canada will salvage their 2011 World Cup and come back with two more to secure their only win. Canada, 2-1. Nigeria deserve nothing and that’s what they’ll get. For everyone involved, lets hope they go home with zero points.